The wild elephant reportedly damaged the compound walls of some houses and destroyed a few trees and cars in Coimbatore's Kovaipudur area. A wild elephant wandered into a residential area in Tamil Nadu's Coimbatore and used its massive tusks to push a car out of its way. The entire incident was caught on surveillance cameras. 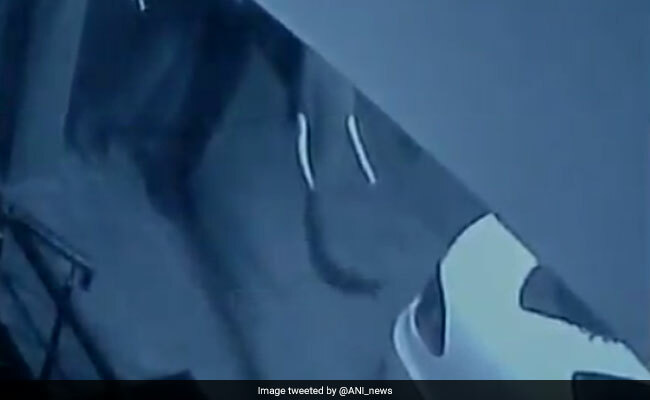 In a 30-second clip posted to Twitter by news agency ANI, the elephant first rushes past the CCTV cameras around 1 am on Monday. In the next shot, taken from a different angle, a dog, presumably stray, can be seen barking frantically. Behind the dog is a white car. As the elephant approaches, the dog bolts. Within moments, the elephant uses its tusks to push the car out of its way. On impact, the car moves a few centimetres forward. The elephant continues to push it forward with its mighty tusks till both disappear from the frame. According to ANI, the wild elephant damaged the compound walls of some houses and destroyed a few trees and cars in Coimbatore's Kovaipudur. Panicked residents contacted forest officials who managed to send the tusker back into the forest. On Friday, a wild elephant strayed into a residential area in Coimbatore's Ganesapuram. Environmentalists explain that large areas around Madukkarai forest were originally elephant corridors and blame human encroachment for this man-animal conflict.